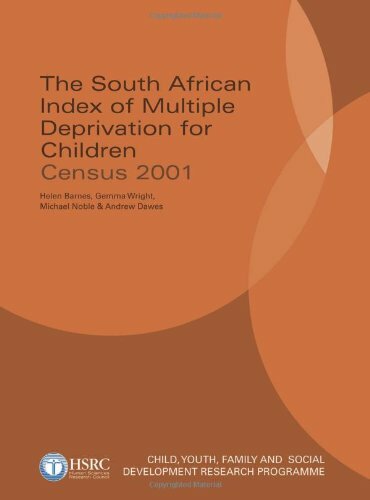 [PDF] The South African Index of Multiple Deprivation for Children: Census 2001 | Free eBooks Download - EBOOKEE! Description: With more than 60 percent of South African children living in households with annual incomes below $1,360 and mortality and maltreatment rates remaining high, this valuable report cites detailed information gathered in the 2001 census to quantify the nature and extent of social deprivation and to identify the areas of greatest need. Providing an informed overview of the detrimental impact of poverty on child development, educational achievements, career prospects, and overall health, these key findings can be used to map child deprivation at a municipal level and should be utilized to inform local-level policy and intervention for developing countries. No comments for "[PDF] The South African Index of Multiple Deprivation for Children: Census 2001".